Carnations permeate our culture from the wedding bed to the funeral wreath. Derided in Shakespeare as ‘nature’s bastards’, they challenged the tulip as the florist’s favourite flower, and went on to give their blessing to both a military coup and a Soho night club. Spanning the world from the gardens of the Ottoman Empire to the Mothers’ Day traditions of America via Chinese medicines and French empresses, Carnation is the first book to tell the cultural history of this hugely important flower. Twigs Way traces the trials and tribulations of early breeders, the florists’ fascination with striped and spotted varieties, delightful names such as the ‘Lustie Gallant’ and the ‘Bleeding Swain’, and the symbolism of the red, white and even the green carnation, which was made famous by Oscar Wilde. Those who appreciate the carnation’s glorious scent, both sensuous and soothing, will delight in the knowledge that the carnation can heal body and mind, used by herbalists in Europe and China. As it ranges from the traditions of the medieval marriage bed to Renaissance paintings of the Madonna and Child, this lavishly illustrated book will entertain anyone with an interest in history, art or culture. It is full of unexpected delights that will charm the mind and invigorate the senses – just like the carnation itself. 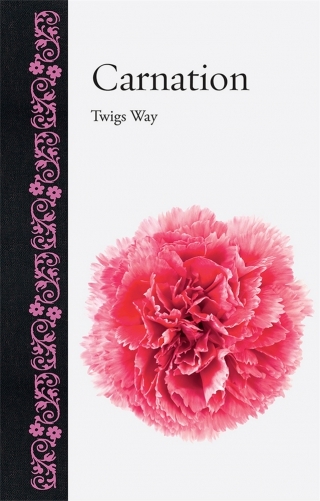 Twigs Way is a writer, researcher and speaker who is fascinated by the social and cultural aspects of garden history. Her publications include works in the Shire series, including Allotments, Tudor Gardens and Cottage Gardens. She has also published A Nation of Gardeners in partnership with the Garden Museum, London. She lives in Cambridgeshire.